VW"s Touran has been restyled to align its look with the latest Golf. DUESSELDORF -- Volkswagen says its new Touran minivan is 27 percent more fuel efficient than the outgoing model. VW says the latest Touran has improved fuel economy thanks to engine downsizing, new fuel-saving technologies and better aerodynamics. Six of the Touran's eight engines, which include three gasoline, four diesel and a unit the runs on compressed natural gas, are new. The engines are all turbocharged with direct fuel injection and meet new Euro 5 emissions regulations. The most fuel-efficient gasoline engine is a 1.2-liter gasoline unit, which, when sold with VW's BlueMotion fuel-saving technologies such as stop-start and battery energy recovery, uses 5.9 liters of fuel per 100 km (about 40 U.S. mpg) and has CO2 emissions of 139 grams per kilometer. 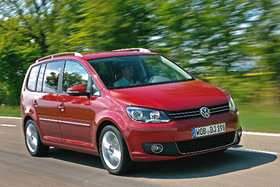 VW gave the Touran a redesign to align it with the new Golf on which it is based. The Touran is mostly used for daily transportation needs while the larger Sharan minivan, which will be replaced next month, is more for traveling, Santelmann said the the model's press launch here. VW says 40 percent of Touran buyers choose the seven-seat version over the five-seat variant. 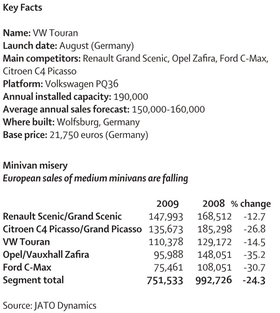 The carmaker has sold 1.13 million Tourans since its launch in 2003. 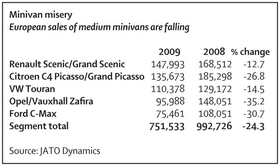 Its best year was 2004 when 191,414 were sold, according to JATO Dynamics.